Only 5,954 Miles! This Toyota Tacoma delivers a Regular Unleaded V-6 3.5 L/211 engine powering it's polished transmission. Sliding Rear Window, Variable intermittent wipers, Trip computer. *This Toyota Tacoma Comes Equipped with These Options *Toyota Safety Sense P Forward Collision, Tailgate/Rear Door Lock Included w/Power Door Locks, Tailgate Rear Cargo Access, Steel Spare Wheel, Spare Tire Stored Underbody w/Crankdown, Single exhaust, Side Impact Beams, Seats w/Cloth Back Material, Reverse Opening Rear Doors, Remote Keyless Entry w/Illuminated Entry and Panic Button. 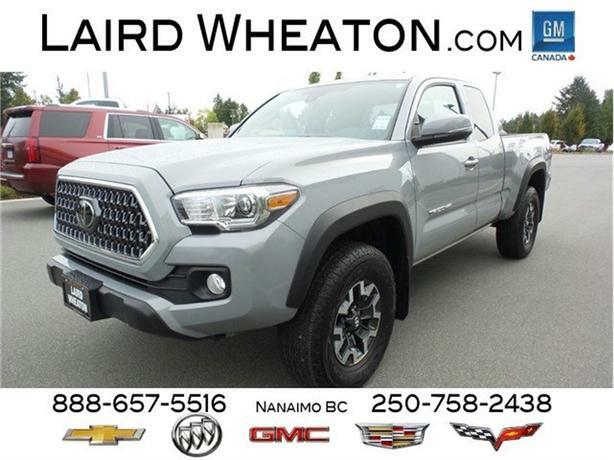 * Stop By Today *Come in for a quick visit at Laird Wheaton, 2590 Bowen Road, Nanaimo, BC V9T 3L3 to claim your Toyota Tacoma!